Pest Control service for all of London Ontario plus surrounding areas such as Strathroy, St. Thomas, Ingersoll, Dorchester, Exeter, Lucan, Goderich, Grandbend, Bayfield and more. We are your Leading Professional Pest Management Company! Bee and Wasp Season has arrived! As the days have become longer and warmer, bees and wasps have been increasing in activity and numbers. Knowing the differences between bees and wasps will help you to understand how to deal with them, how to remain safe, and when to contact a professional licensed pest control professional. Bees are generally less aggressive than wasps, and are larger in width, and hairy. Wasps are more aggressive, narrow and hairs are less visible. Each species is beneficial in nature, providing valuable pollination services and the control of countless other insect species through predation or parasitation. Control may be necessary when nests are constructed in or on structures or in recreational areas. What follows is a description of commonly found wasps and bees in the London, St Thomas, Grand Bend and South-Western Ontario areas. Yellow Jackets- are Yellow are Black colour and are 10-16mm in length, 1000-4000 individuals per colony. Bald Faced Hornets are white black in colour and are 15-20 mm in length, with 100-400 individuals per colony. Nests can be located in the ground, within wall voids of structures, in shrubs, on trees, under decks or attached to homes etc. Nests may or may not be visible, are constructed of paper-like material, and are usually grey in colour. When visible, they may be football shape like in appearance. These social insects will readily defend their nests when disturbed. Each individual is capable of stinging multiple times. Reactions to stings will vary depending on the number of stings and the individual’s body’s response. In some instances, medical attention may be required. If prescribed an Epi-pen it should be with you at all times, it cannot help you if it’s in your home or car. Early identification of nests within high risk areas should be completed by visual inspection. Control when warranted should be completed by an appropriately labelled dust, liquid or aerosol product. These wasps are brownish in colour with yellow markings. Size varies depending on the species. These wasps have long legs. Nests range in size from that of a toonie to an open hand. Nests cells are visible and typically contain 150-250 cells. Nests may be constructed in voids of homes, in attics, at roof points, within exterior lights, and on the underside of branches. These insects are less aggressive than other wasps but will still defend their nests when threatened. Paper wasps are capable of stinging multiple times. Carpenter bees are 12-25mm in length and are black and yellow in colour. These bees are similar in colour to Bumble bees but have a bare, shiny abdomen. As their name suggests these insects bore into wood making a round hole 12mm in width and approximately 10-15 cm in length. These bees are not social; they do not live in nests, or colonies. However many individual can often be found in the same area. 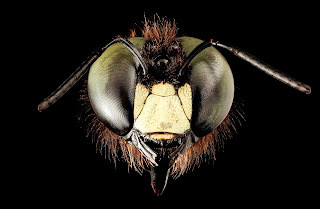 Male Carpenter bees are territorial, often becoming aggressive towards other insects, birds and people. Male bees do not possess a stinger so they cannot sting. Females do posses a potent stinger but rarely use it. Nest galleries are constructed in logs and stumps, unpainted boards and weathered wood. To reduce risk of activity, old logs and stumps should be removed and unpainted or weathered boards should be repainted. If galleries and bees are present treatment will be required to provide control. Bumble bees are large and fuzzy sometimes containing orange markings. They are 6-25mm in length. Theses bees are social; nests typically contain 50-400 individuals. Nests are usually constructed underground, often in an old mouse burrow. When constructed in a structure, it’s usually low to the ground in a void or cavity. Bumble bees are not aggressive but will defend the nest when threatened. 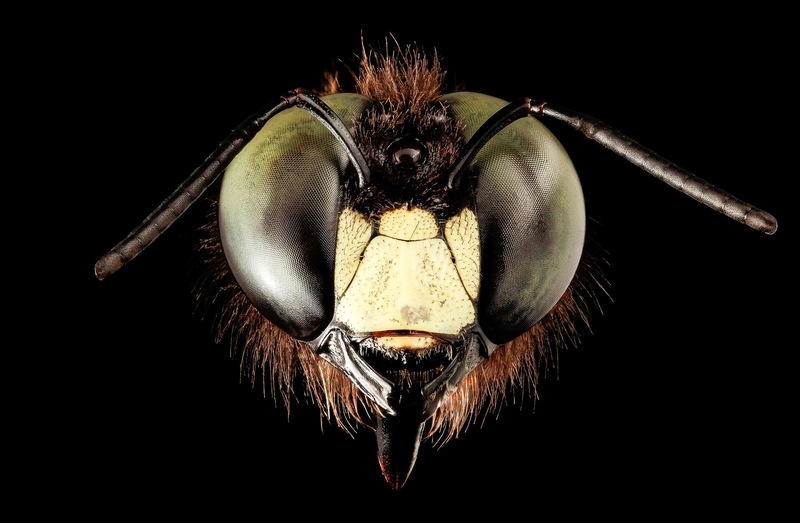 These bees have unbarbed stingers and are capable of stinging multiple times. These highly beneficial insects are 11-15mm in length and are orange and black in colour. These bees are social in nature; colonies typically contain 20000-80000 individual bees. A single queen is present in each colony, laying 1500-2000 eggs per day during the warm weather months. These bees are not aggressive but will defend their colony if threatened. Each bee can sting once prior to dying. If stung, remove the stinger quickly with a nail, knife or credit card to minimize the amount of poison absorbed. Do not grasp the stinger with your fingers or additional poison will be released. Honey bees construct colonies of wax in tree cavities, in wall voids, attic spaces, and hollow floor spaces and on structures or bushes. Bee swarms are produced in some colonies during the months of May, June and July. These swarms may be seen on trees, cars, homes etc. These insects are not aggressive when swarming and should never be sprayed or killed. Please contact Sawyer Pest Management or a local bee keeper for pick up and hiving. Nests already present within walls or voids require removal of not only the bees but also the , wax and honey stores. to gain access to the nest floor boards and or drywall may require removal. It is not recommended to kill Honey bees within walls and to leave the colony in the void area as this will increase the risk of new bee activity in future years, mouse activity, and additional bee activity as well as honey seepage into the home. Hive removal may take 3hrs to 2 days. If you are having problems with bees or wasps please contact Sawyer Pest Management Inc. for additional information and control options. Sawyer Pest Management Inc. is your local pest control professional and is licensed by the Ontario ministry of the Environment and is insured to provide pest management services. Each service representative is a licensed structural exterminator, and is trained and competent in the services we provide. Sawyer Pest Management is proud to provided service programs in the communities of London, Melbourne, Ingersoll, Aylmer, Port Stanley, Strathroy, St. Thomas, Parkhill, Grand Bend, Bayfield, Exeter, Lucan and St. Marys and in the surrounding communities. Honey Bees - What’s All The Buzz About? Bees are found all around the globe, with more than 20,000 species known of to date. Honey bees represent a small percentage of these species, but as pollinators they are incredibly important to the survival of mankind. One quarter of the food humans consume comes from crops pollinated by honey bees. It might be surprising, but beekeeping is one of the oldest agricultural efforts known to humans. Today, beekeeping is both a hobby and a business. Honey bees can be recognized by their golden, light brown colour and oval shaped bodies with dark-to-light ridges along their abdomen. They are typically about 15mm long and are covered with a golden fur. These herbivores are typically non aggressive, but they do have a stinger, which they will use if they feel threatened. For this reason, it is best to have a professional come and remove any honey bee nests that might be located near your home or business. Honey bees are unique from other bee species because they are extremely social creatures and live co-operatively among other members in the hive. In the wild, hives can typically be found in hollow trees; although, in rocky areas, caves and crevices in rocks can also be a good spot for bee hives. Honey bee hives can also be found in homes, most commonly in wall voids. A honey bee hive is made entirely out of a wax that the worker bee secretes from a highly specialized gland in its abdomen. The worker bee takes a couple pieces of wax from their abdomen, mixes it with saliva until it’s soft enough to form into the comb cells that make up the hive. In Canada and the rest of North-America, man-made bee hives are called apiaries and are constructed out of wooden box frames stacked on top of one another to make the hive. One Queen - The queen lays eggs in the cells of nest and establishes new colonies; she can produce up to 2,000 eggs daily. The queen bee mates with drones; this happens only once in her life. She has a special organ that allows her to store sperm and release it, as needed, to fertilize eggs. The queen honey bee will produce worker bees for the remainder of her life, usually lasting up to five years. Drones - These are male bees that have only one job, to mate with virgin queen bees; they die shortly after mating which happens in spring and summer. Drones are the minority in the hive; because their only purpose is to mate with virgin queens, they are forced out of the hive in the fall to conserve on food for the queen. Workers - These are infertile females with several important duties in their short life span of 35-40 days. Her first job, as a one day old worker, is to: clean the cells in which the queen will lay eggs, clean the new bees, and seal brood cells once an egg has be laid. At three days old she will tend to larva and the queen. As she ages she will take care of: feeding and cleaning the queen, cleaning the comb, making honey, and protecting the hive from outside intruders. 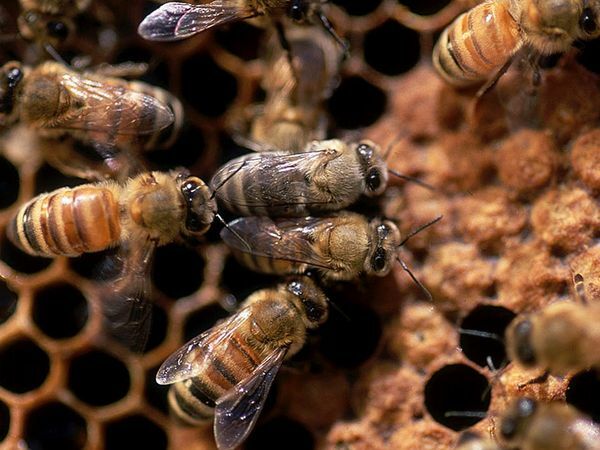 As worker bees get older they will take care of: secreting wax and building cells, cleaning the hive, pollen packing, nectar ripening, sealing honey cells, and maintaining hive temperature by fanning the comb. The last stage of the workers life involves working outside of the hive, including: protecting the hive, foraging, making sure the hive is well ventilated. Swarming is a natural part of a healthy bee colony and will happen when a hive has limited space. This happens when the honey production is so great that the bees being fill cells that were intended for eggs. With limited space for egg laying, the queen with leave and split the colony. In this case, a queen bee will leave, bringing with her half of the worker bees and leaving behind a new virgin queen to ensure the survival of the hive. A honey bee swarm may consist of thousands of worker bees that temporary form a cluster on tree branches or shrubs, and will remain there for up to a few days; during this time a scout honey bee searches for a new location for the colony. Once a site is located, the swarm immediately flies to the new site. Honey bees and flowering plants live in symbiosis, depending on one-another to carry out their jobs on planet earth. Our planet would be drastically different without honey bees here to cross-pollinate flowering plants and fruit blossoms, which is why these creatures are of such high importance to humans. They are responsible for pollinating a vast amount of crops that produce seeds and food for our survival. This is why it is important to understand the significance of pollination by honey bees and to protect them through education and research. Honey bees serve an important purpose, but they can also pose a problem and sting you if they feel threatened. This is why it’s important to have a professional remove a honey bee nest that may be located in or around your home or business. Honey bee nests can often be found inside of wall voids and the roof of a home. It is vital that you do not try to kill a honey bee’s nest. These creatures are decreasing in numbers and need to be protected, not killed. Sawyer Pest Control is available to remove bee swarms and or nests located within structures. Once captured or removed, bees are placed into a hive and relocated from the site to a foster location or one of our yards. This is a time consuming and labor intensive process that requires skill, proper equipment and the specialized clothing. Sawyer Pest Control uses environmentally friendly methods to deal with honey bees, ensuring the least amount of damage to the area requiring removal, if any. A professional will safely remove the bees and relocate them to an awaiting hive or apiary, where the bees can continue with their job of pollination and humans can benefit from their honey production. This is a unique control process which supports the survival of the honey bee allowing for continued pollination services. Below are some photos of a honeybee removal from a home. Holes in the exterior of a house allow bees to move inside and locate a nesting place. The honey bees are nested under the floor. Carefully, we access the sub flooring to expose the nesting site. The honey bee’s have made a hive in the insulation beneath the floor as shown here. The bee’s have been carefully removed and placed in a bin for relocation. Sawyer Pest Management is proud to provided service programs in the communities of London, Melbourne, Ingersoll, Aylmer, Port Stanley, Strathroy, St. Thomas, Parkhill, Grand Bend, Bayfield, Exeter, Lucan and St. Marys and in the surrounding communities. Below are some action photo’s of honey bee removal by Sawyer Pest Control. While employed in the pest control industry Ryan has serviced, developed, implemented and audited professional environmental Pest Management Programs (EPM) and Integrated Pest Management (IPM) programs. These programs are effective at reducing or eliminating pesticide usage, while maintaining a pest-free environment for Residential, commercial, Industrial and Agricultural clients. Ryan has extensive experience developing individualized programs that use a variety of methods and tools which identify conditions conducive to pest development. These programs allow for the early detection of activity and allow for the elimination of early stage pest activity, and/ or eliminate heavy infestations through clean-out programs. OWEN SOUND - A Varney, Ont., woman didn't realize the extent her little house has been taken over by bees until cracks appeared in the ceiling and honey began to drip about two weeks ago. "We don't hear them buzzing or anything. It's just the crack in the ceiling. Like you're standing in the kitchen and you get honey dripped down your hair. It's not pleasant," Loretta Yates said Saturday as she and her husband Kevin prepared to rid their house of the unwanted pests. "Until we'd seen the massive honey dripping and stuff, I didn't know what we were really dealing with was as big a problem as it's turned out to be," Yates said. The bees are between the main-floor ceiling and the floor of the upper level over the kitchen and living room. Both ceilings have cracked and are leaking honey. Upon closer inspection, the kitchen light cover was half filled with honey, she said. An Elmwood, Ont., beekeeper who was called in to investigate figures Yates could have 2,000 pounds of honey up there. She has two colonies of up to 180,000 honey bees and a nest of nasty yellow jacket wasps, he believes. The Yates live with their 22-month-old son, Justin, in a 1 1/2-storey cement block house she bought five years ago along Highway 6 in Varney, in Grey County. Her neighbour runs a garage and the bees are bothering customers there. The bees may have been living there for four years, she said. Yates isn't sleeping well now. She paces the house at night, concerned about the flickering lights, fearful the ceiling might collapse and the bees could swarm inside. Monday morning beekeeper David Schuit and his helpers will pull down the ceiling in the kitchen and living room, and remove the honey which he hopes can be saved. He'll clear out the bees and their honeycomb, and attempt to find both queen bees and put each in a wooden hive box which he'll place inside the house. Each colony is separated by a partition in the cavity above the ceiling. He mustn't disturb that because otherwise the bees won't get along. "If the queen leaves the hive, the whole hive goes with her. They don't want to stay in the hive without her," Schuit said. "It's really amazing. Bees are fascinating." He said bees have taught him how to behave to get the job done without causing his stomach to churn with dread. "Bees are very friendly once you learn how to work with them, he said, adding, "They're also "very protective of each other." He'll go after the yellow jackets last. They're more aggressive and can sting about eight times in one day and still survive. He doesn't intend to spare them -- he'll spray an insecticide. "They're very unruly," he said. Schuit runs a family business called Saugeen Country Honey, south of Elmwood. He has about 1,000 to 1,200 hives and sells various kinds of honey and related products at his store, plus at the Keady Market and at one in St. Jacobs, Ont. "We're really grateful for him and his help, with Saugeen Country, 'cause I don't know what we would do otherwise," Loretta Yates said. "This is overwhelming and a big project. I'm still hardly believing it. It seems like a dream; a terrifying dream." Initially, a pest control expert told her he could dust the bees to kill them, but that would leave the honey, which would just attract more bees. A week ago last Tuesday Yates got an eyeful when she looked outside and saw what Schuit believes was likely a third honey bee colony. "It was another swarm of bees coming, like another hive of bees coming here, but the house was already full. So they couldn't actually get access into the house, so they just swarmed on the outside," she said. "And it was just black. You'd hardly believe it was bees. It was just like a blanket," she said. Yates can't help but joke a little about her bee problem. She told a co-worker at Saugeen Villa nursing home in Hanover, Ont., where Yates works part-time, "I have honey in my house. I must be the queen bee." Someone called her predicament "a real sweet mess." There's nothing funny about the damage and the cost to put it right and her insurance company says she's not covered. "They've chewed right through the wall, like on the outside top gable end," Yates said, incredulous the insurance wouldn't come through for her. We are available Monday through Friday and most nights and weekends to serve you. We service all of London Ontario plus surrounding areas such as Strathroy, Ingersoll, Dorchester, Exeter, Lucan, Goderich, Bayfield, Ailsa Craig, Appin, Arkona, Aylmer, Beachville, Belmont, Clinton, Dashwood, Dutton, Glencoe, Grand Bend, and more! Sawyer Pest Management Inc. Picture Window theme. Theme images by gaffera. Powered by Blogger.